Maplewood of Sauk Prairie - 6/13 - Testimonial: Hello, my name is Josephine Z, I am from Baraboo and I have just spent a month at Maplewood of Sauk Prairie in rehabilitation for a broken ankle, and I am now residing at Maplewood Village. I want to talk about the rehabilitation center. In June, on June 17th, I was trying to do some outside painting on a two-step stool and I took a tumble and broke my ankle in a couple of places. Something that I have never done before in my life. So my last thought for this summer was that I would be in a rehabilitation center, but I want to tell you about Maplewood, it's an amazing place. The staff is fantastic. They are always there, they are always present. They are helpful, they are cheerful, they are fun. I came to love them very much for their hope for me. and ah, there is never anything that you want that they cannot try to do for you with--with great cheerful spirits. I am now at Maplewood Village, hoping that I can, as soon as my ankle is ready for rehab, I will be able to travel by wheelchair, back over there for rehabilitation in their therapy department, which is also wonderful. The girls there and the men there are just super, and working with the patients and with the greatest cheer. I don't know how they do it, they are-- all of them when deal with people that are much more disabled and injured than I. I feel like an imposter with just a broken ankle, but it is a great place and I cannot say enough for it. The food is wonderful. The help is great. The surroundings are very pretty and very tastefully kept, and I would recommend it to anyone who needs that kind of service. Neurological diseases continue to be studied, but for as much as we have learned about them, there is also much that we still don't know. Recently, however, researchers made a new finding that may not only change textbooks, but will change the way that we understand the link between the brain and the immune system. Researchers from the University of Virginia School of Medicine have determined that the brain is directly connected to the immune system by vessels previously thought not to exist. These findings may lead to ground breaking new discoveries in neurological conditions, such as Alzheimers Disease, Multiple Sclerosis, and many other neurological diseases. Never known previously, the researchers have found a lymphatic system for the central nervous system (CNS). As an example, it is know that Alzheimers Disease is caused by large chunks of proteins that build up in the brain. This lymphatic system of the CNS may be inefficient in those patients who develop this disease and so more research needs to focus on this. “Instead of asking, ‘How do we study the immune response of the brain?’ ‘Why do multiple sclerosis patients have the immune attacks?’ now we can approach this mechanistically. Because the brain is like every other tissue connected to the peripheral immune system through meningeal lymphatic vessels,” said Jonathan Kipnis, PhD, professor in the UVA Department of Neuroscience and director of UVA’s Center for Brain Immunology and Glia (BIG). “It changes entirely the way we perceive the neuro-immune interaction. We always perceived it before as something esoteric that can’t be studied. But now we can ask mechanistic questions.” These finings will be published in the prestigious journal, "Nature". For more information: NeuroscienceNewsWe've received a wonderful testimonial from Colleen, who received physical therapy and occupational therapy at Maplewood of Sauk Prairie. Following an orthopedic surgery, Colleen made the decision to have her rehabilitation here at Maplewood. Watch the video that describes her experience that she had with us. Improve your posture and you could improve your mood. Studies show sitting up with your spine straight and shoulders back can make you feel happier and more confident. Psychologists say this simple physical change lowers stress hormones and increases happiness hormones, which can cue the brain to switch to a more positive and poised state of mind.Here is a testimonial about the fantastic physical therapy and occupational therapy that was received. Colleen had fractures of the pelvis and shoulder after a fall. In order to recover, she chose to receive care at Maplewood of Sauk Prairie. Life is ironic. A brilliant man, who dedicated his life to improving the health of humans, was claimed by Alzheimers in the prime of his career. Larry Whitesell grew up in Pennsylvania and attended Delaware College with a degree in animal husbandry. He married, Donna Keckler. Together, these opposites completed each other in a very complementary way. They had two daughters and now have two beautiful granddaughters. In 1983, Larry uprooted his family and moved from Hershey Pennsylvania where he dedicated 15 years of his life doing cardiology research at the Hershey Medical Center in Pennsylvania. As a leader in his field, he was noticed by the University of Wisconsin’s head of cardiology and was offered a ground breaking position at UW Wisconsin where he started a program in Cardiology Research. As Larry was blazing a trail utilizing gene therapy in cardiac research, he noticed some memory issues. In 2010, he retired early and was diagnosed with the early onset of Alzheimer’s. When Larry reached the stage where his family was unable to care for him, he came to Maplewood of Sauk Prairie to receive skilled care and physical therapy. Maplewood has adopted the “Music in Memory” program where people with dementia and Alzheimer’s listen to favorite songs from the early adult years. This program has been known to provide joy and bring a person back to themselves while the music is being played. Those listening to music have experienced calming behaviors and may have the ability to respond in the present for a while after a listening session. Larry is one of the success stories associated with “Music in Memory”. As a result, he is experiencing more connections to his surrounding, making more eye and verbal contact. Larry made a difference in many people’s life by doing cutting edge research. He has plans to continue contributing to society after he passes. He will be donating his brain for research in the hopes that scientists can pinpoint the gene that causes Alzheimer’s and a cure will be found. As people grow older, they find that they are not quite as agile, flexible or strong as they used to be. However, to maintain their health, seniors still need to keep an active lifestyle. They can’t do that if their body’s functionality is impaired. Physical therapy in Waunakee, WI and nearby areas helps seniors regain or improve their balance, strength and flexibility so they can continue living healthy, independent lives. Here’s how physical therapists can help elderly loved ones overcome the challenges of aging. Pain Management Sedentary lifestyles among seniors can lead to pain due to the stiffening of the joints. Physical therapy can help increase mobility to reduce pain especially after surgery or hospitalization. A study in Current Reviews in Musculoskeletal Medicine states that physical therapy combined with occupational therapy can bring pain relief to patients with osteoarthritis. Since taking multiple medications a day is a huge problem with seniors, physical therapy can be an alternative to taking pain medications and other drugs. Seniors who are not ideal candidates for surgery can also improve instability caused by osteoarthritis. Bladder Control Most seniors, especially women, will encounter urinary incontinence at some point. Stress may be a huge contributor to loss of bladder control but the strength of the muscles that support the bladder plays a bigger role. Muscles normally weaken as people age, and to restore the lost strength, seniors can turn to physical therapy. Pelvic floor exercises can fine tune the muscles to provide better support to the bladder and eliminate the problem of incontinence. Fall Prevention Falls are among the biggest causes of injuries among seniors. The Centers for Disease Control and Prevention estimates that about a third of the population of older adults each year are expected to suffer from a fall. The largest concern here is that seniors undergo physical therapy only after they’ve sustained injuries resulting from a fall. The correct approach is to prevent falls using physical therapy. Physical therapy in Lodi, WI can help the elderly improve postural control and lower limb strength, thereby enhancing their balance to avoid any accidents. Physical therapy should be a standard part of treatment plans for people over the age of 60. Therapists from healthcare campuses for seniors like Maplewood of Sauk Prairie can improve quality of life for your elderly loved ones. Sources: Physical Therapy: A Helpful Intervention for Many Seniors, www.LifelineSys.com The Importance of Physical Therapy for Seniors, American Senior CommunitiesAmong the leading causes of death in the country, Alzheimer’s ranks sixth, and is deemed to be the only one that cannot be prevented or cured, according to Alzheimer’s Association. At present, around 5.3 million Americans are suffering from this memory disorder, 96 percent of which are age 65 and older. What is Alzheimer’s disease? A person with Alzheimer’s disease experiences brain degeneration. This means that the cells composing the brain begin to die progressively over a course of time, and as this happens, the sufferer loses his memory and certain abilities. Alzheimer’s disease has a number of risk factors, some of which are inevitable like age and gene inheritance, while others like diabetes, high cholesterol, and high blood pressure can be avoided and modified. Importance of Alzheimer’s Care People with Alzheimer’s disease require professional care in a nursing home, a common facility in Wisconsin villages like Saulk Prairie and Prairie Du Sac. A nursing home in Saulk Prairie such as Maplewood of Sauk Prairie has a memory care center that provides a special memory impairment program designed to preserve the patients’ dignity and freedom. This program consists of individual and group activities that help the patients develop self-confidence while improving their physical abilities, which have been affected by Alzheimer’s disease. Unlike other programs, this one is implemented in a safety-controlled and restrain-free environment. Involving Technology and the Family To keep the patients connected with their families, experts from a nursing home in Prairie Du Sac, WI teach families of their patients how to better handle and deal with their loved ones given their condition. They are taught to use available technology to ensure that their loved ones are safe and won’t go missing when brought to the park, for example. Reminder messages and clocks specially designed for dementia patients are also helpful tools. More advanced technologies such as GPS location and tracking devices, and electrical use monitoring, are also becoming popular Alzheimer care aids. Along with proper training, caregivers in nursing homes are also taught to use these devices to provide the best care possible for their patients. The family, which plays a huge role in the patient’s recovery, is ideally involved in the care, too. Source: 2015 ALZHEIMER'S DISEASE FACTS AND FIGURES, alz.org 7 Technological Innovations for Those with Dementia, alzheimers.netHere at Maplewood of Sauk Prairie, we are proud to be a place that people in need of a reliable Prairie du Sac physical therapist can go to. 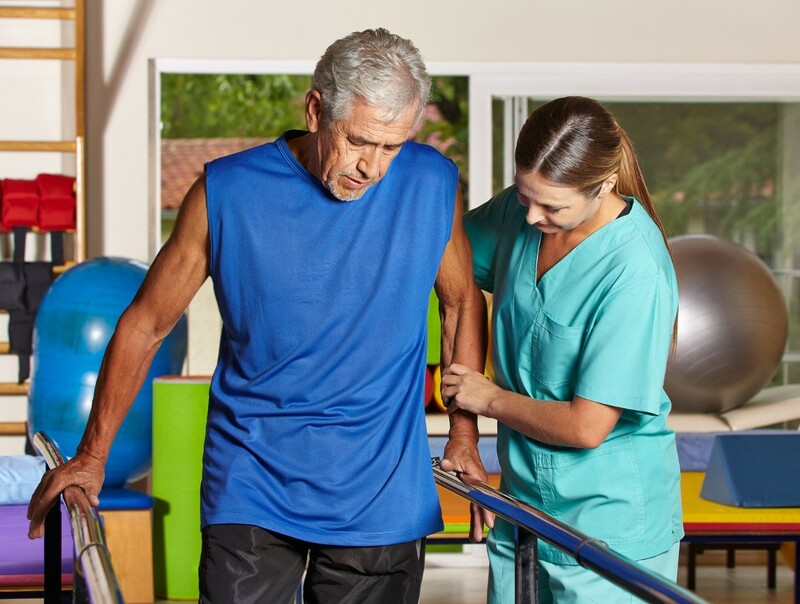 For years now, our physical therapists and therapy staff have been providing help to the surrounding communities in the form of comprehensive rehabilitation services. Our physical therapy services can be applied for a variety of situations to help people recover from persistent pain, recuperate from injuries both old and recent, regain proper functionality, improve from gait imbalance or dizziness, and generally improve on the physical activities of daily life. Also, our physical therapy team is happy to help people recover after surgical procedures. Knee replacement and hip replacement are two of the surgical procedures that our post-recovery services are designed to handle. Surgery is just one part of knee or hip replacement; to gain the full benefits of the procedure, post-surgery rehabilitation is a must. It’s important that the patient gets adequate exercise while making sure that the involved areas do not get forced too much. The patient needs to regain strength and motion while managing the pain that can only be expected after the surgery. Scar tissue may also limit the flexibility of the new joint if proper exercise is not performed. We understand the specific needs for this situation, which is why we provide targeted physical therapy in Sauk City, WI. At Maplewood of Sauk Prairie, our physical therapists and staff have the experience, skills, and training that enable them to manage rehabilitation for a wide array of situations, including the physical therapy needed for post-knee or hip replacement surgery. With proper guidance and motivation, the patient can be assured to reap the good fruits of their surgery. In order to make sure that the physical therapy plan is appropriate and carefully tailored to the needs of each patient, we work closely with the respective surgeon who handled the procedure. We make it a point to maintain ongoing communication between the therapist and the surgeon to pave the patient’s smooth road to recovery. To know more about our services, please continue browsing our website.Here at Maplewood of Sauk Prairie, we want to be more than just a premier Sauk Prairie nursing home for Baraboo , Sauk Prairie, and Lodi clients; we also aim to provide exceptional care. We like to keep our services of the highest quality, whether our residents need rehabilitation, long-term care, or memory care. Speaking of memory care, we take pride in the services we provide for patients with dementia and Alzheimer’s disease. Dementia is a broad category of brain conditions that cause the patient to experience a gradual decrease in thinking ability and memory. Common symptoms include reduced motivation, language problems, and emotional issues. For a person to be diagnosed with dementia, the decline in mental function should be significantly greater than what is expected from aging. The most common among the different types of dementia is Alzheimer’s disease, which affects an estimated 5 million Americans. The most prevalent symptoms are gradual yet severe memory loss and difficulty performing otherwise familiar tasks. Symptoms of Alzheimer’s start off mild but often get worse as years go by. The effects of the condition are truly hard to deal with both on the part of the sufferer and the people around him or her. The patient can be confused about what day and year it is, find trouble with writing and speaking, display poor judgment, become moody, exhibit drastic changes in personality, and frequently lose things by being unable to backtrack. At Maplewood of Sauk Prairie, we understand that special care is needed to treat dementia. More importantly, we understand that it would give peace of mind for patients and their loved ones if care is given to ease up the more prominent effects of dementia. This is why we provide memory care for our patients who need them. As a caring nursing home for Lodi and Baraboo residents, we provide special programs tailor-made for the needs of each patient. There are group activities designed for ongoing social skills as well as memory care activities that help with the effects of dementia and Alzheimer’s disease. Through the individualized programs, we ensure that each day will be a meaningful step toward better management of these conditions. To know more about the care we provide, please continue browsing our website. We’ve received a wonderful testimonial from Colleen, who received physical therapy and occupational therapy at Maplewood of Sauk Prairie. Following an orthopedic surgery, Colleen made the decision to have her rehabilitation here at Maplewood. Watch the video that describes her experience that she had with us. Physical Therapy Testimonial by Colleen S.
Here is a testimonial about the fantastic physical therapy and occupational therapy that was received. Colleen had fractures of the pelvis and shoulder after a fall. In order to recover, she chose to receive care at Maplewood of Sauk Prairie.